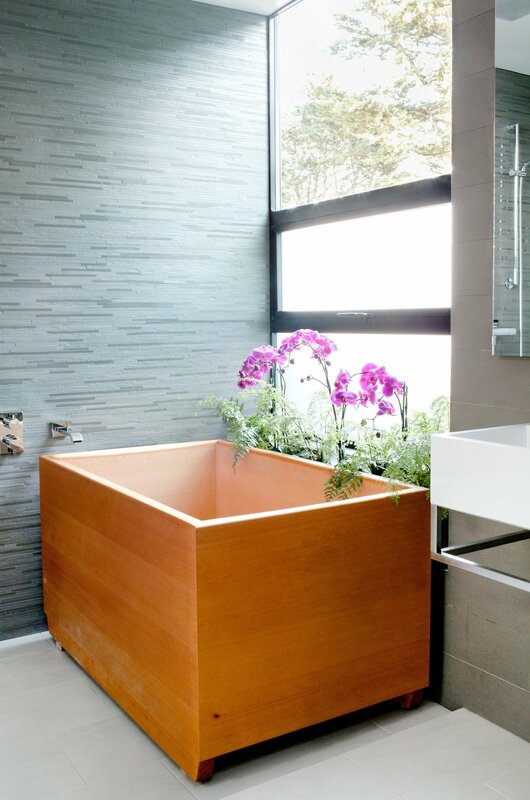 Houle designed the ofuro tub in the master bath to mesh with the home’s tallowwood wall paneling. 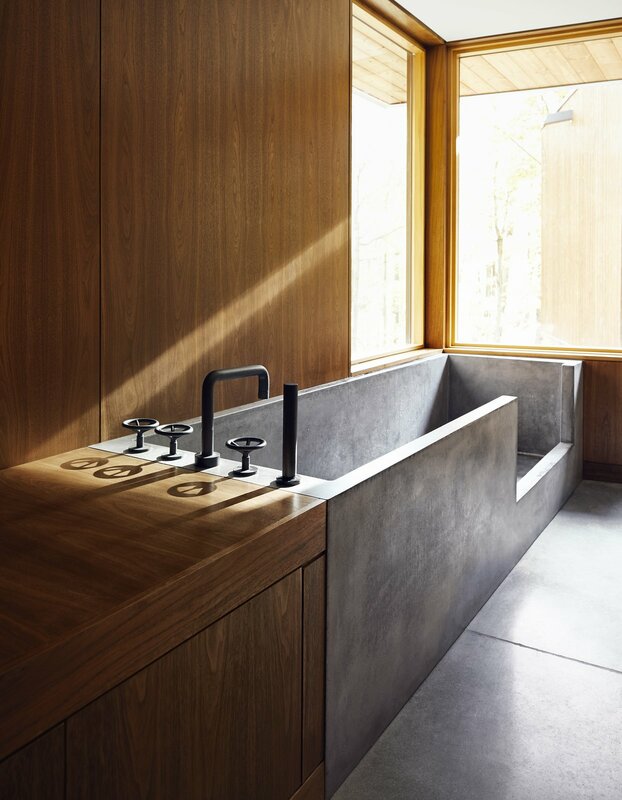 The Ikea sink is outfitted with Vola faucets. 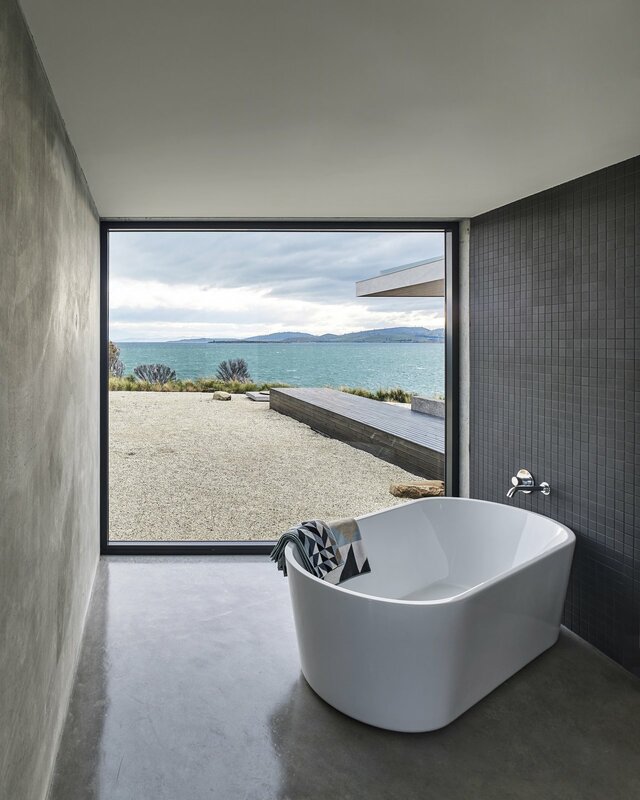 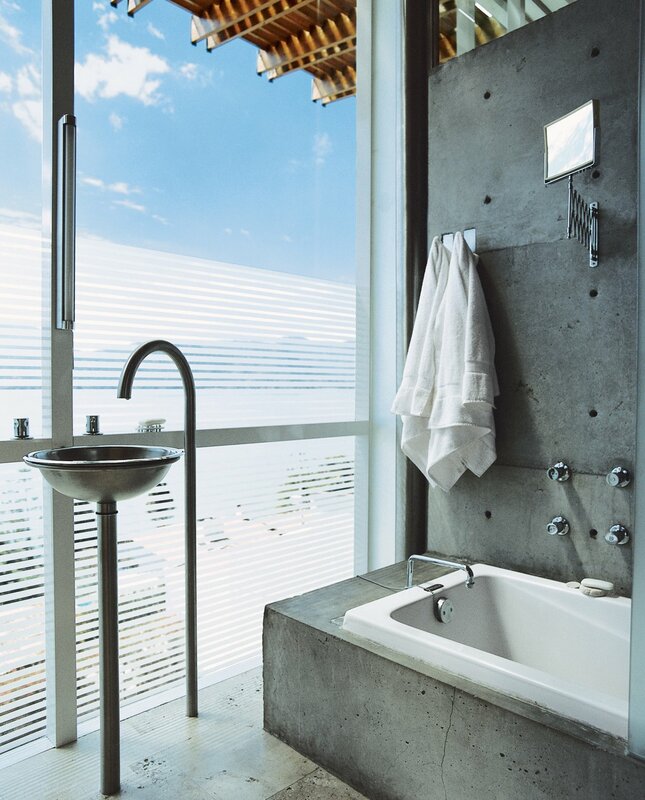 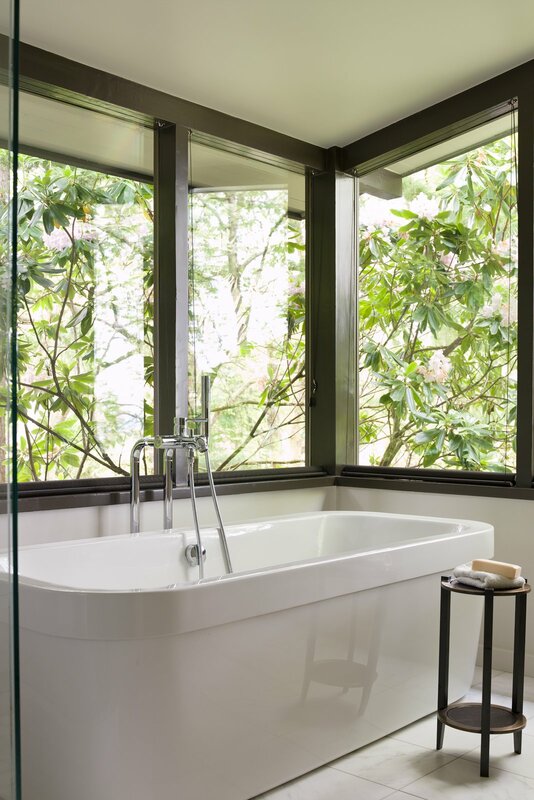 In the master bath, a Dornbracht tub filler is paired with a tub by Philippe Starck for Duravit. 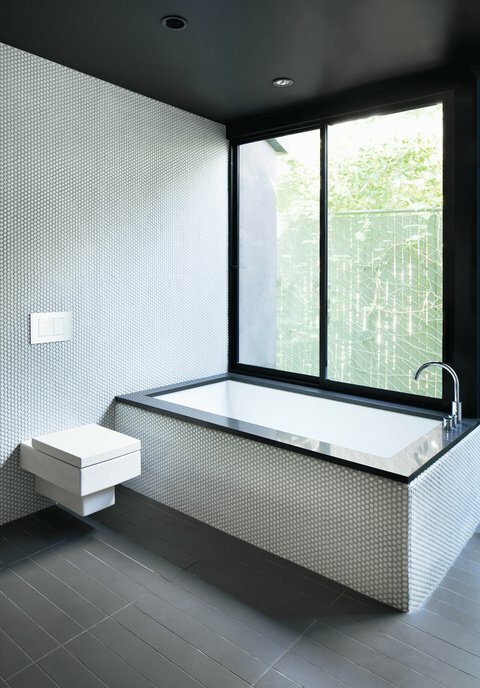 In the master bath, the architect managed to combine privacy and a view by adding a horizontal-line pattern to the glass wall. 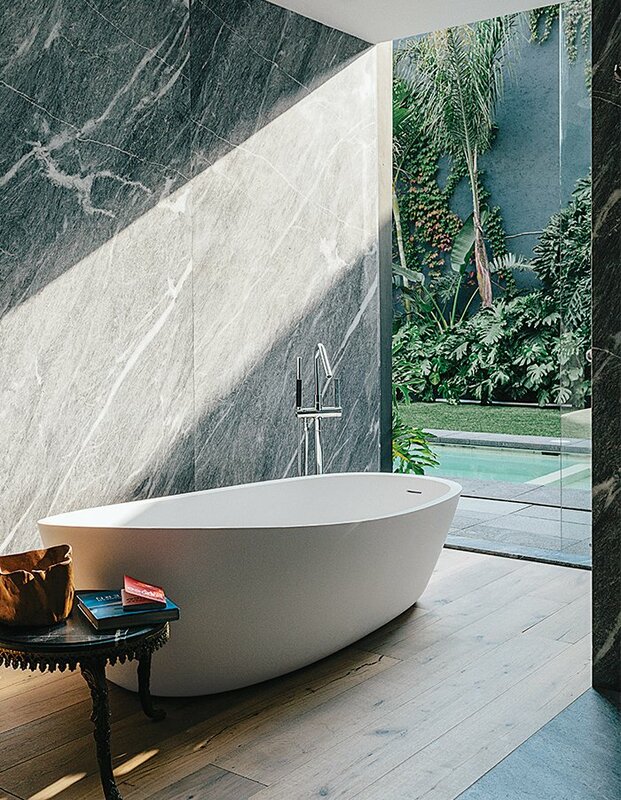 An Almond bathtub by Porcelanosa is accented by a tub filler from Hansgrohe. 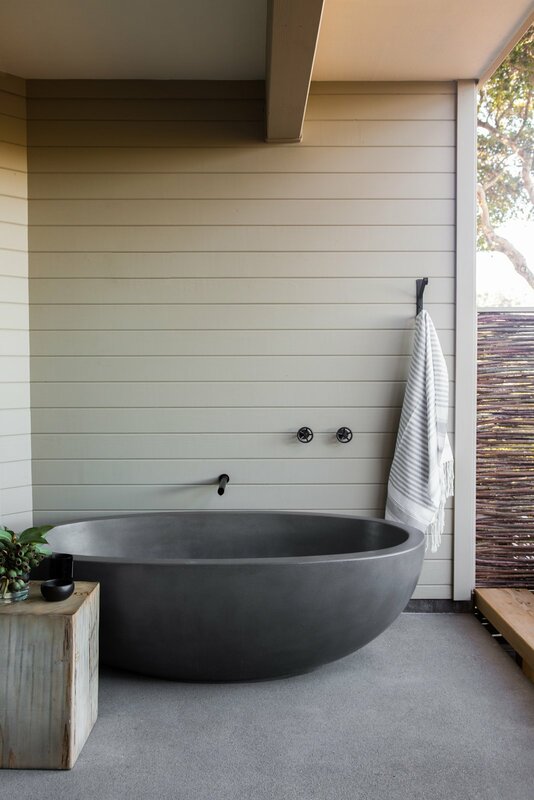 Concreteworks cast the custom outdoor soaking tub. 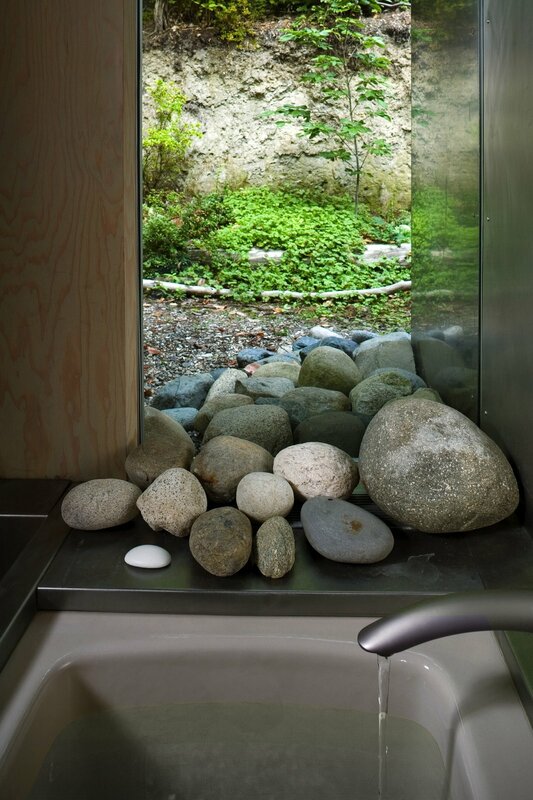 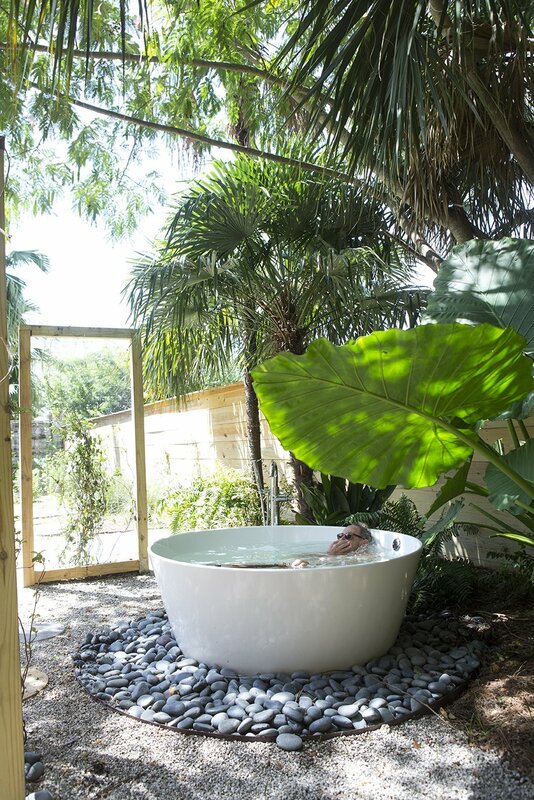 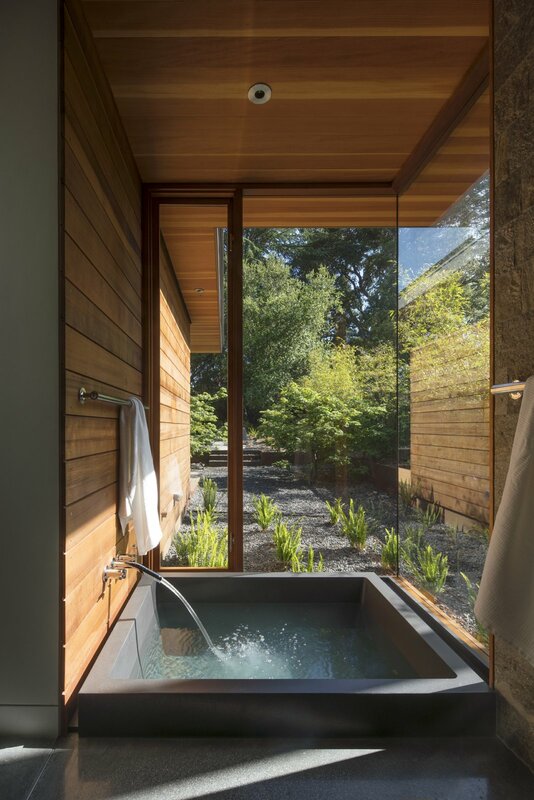 Outdoor Tub: A tucked-away bathtub provides a private backyard oasis. 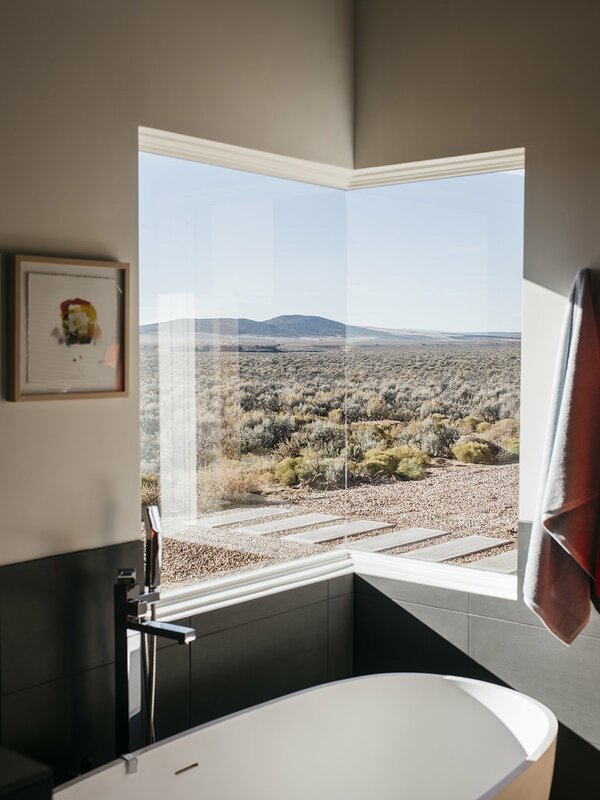 “We kind of got carried away,” resident Maury Strong recalls of the decision to place the 59-inch freestanding Keren basin outdoors. 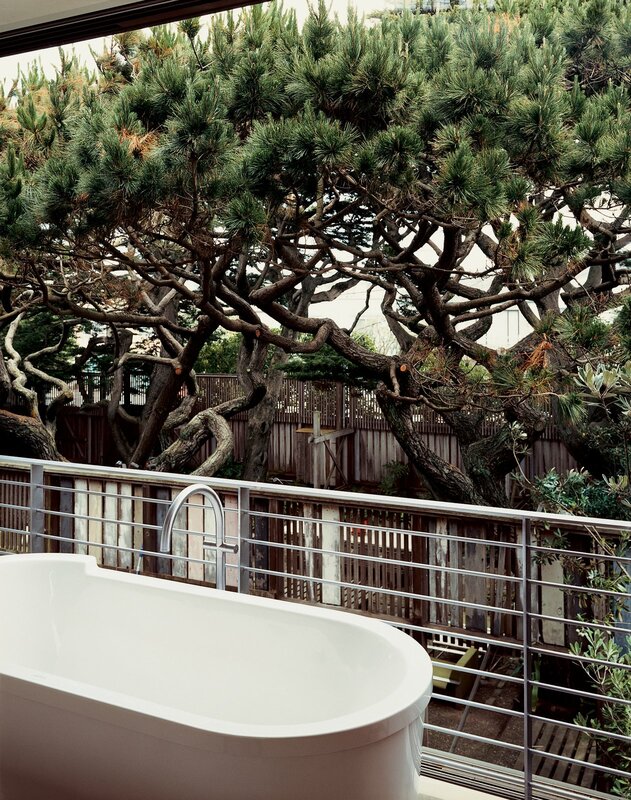 “My view was, ‘Let’s just do it all.”’ The extra effort paid off—the outdoor bath is among her grandchildren’s favorite parts of the house. 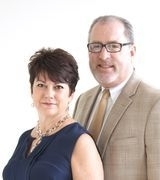 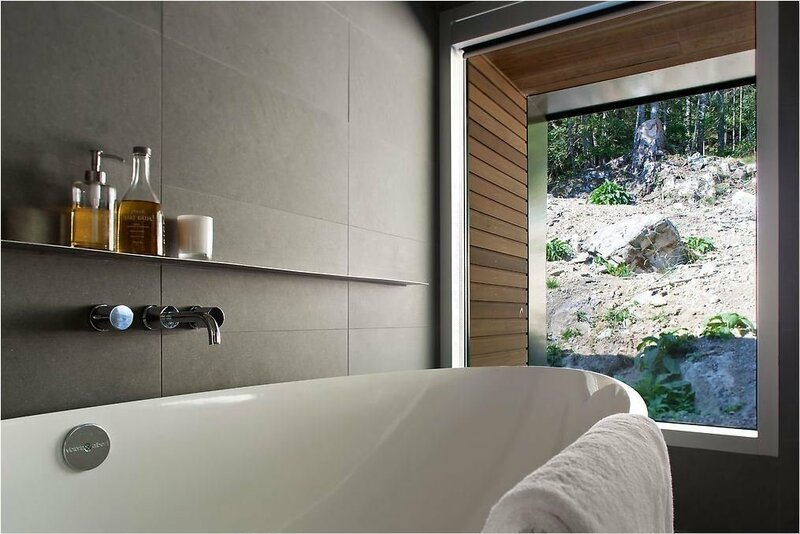 Her husband, Ron Caron, also enjoys relaxing there. 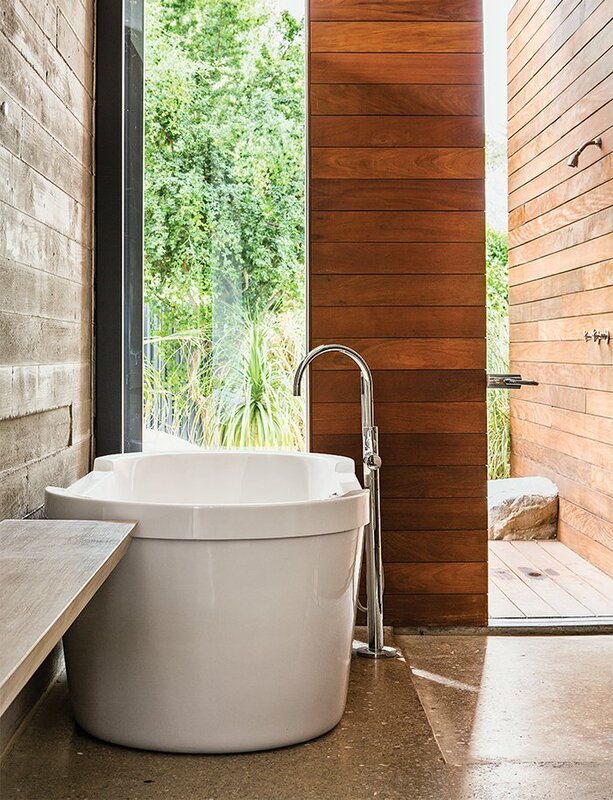 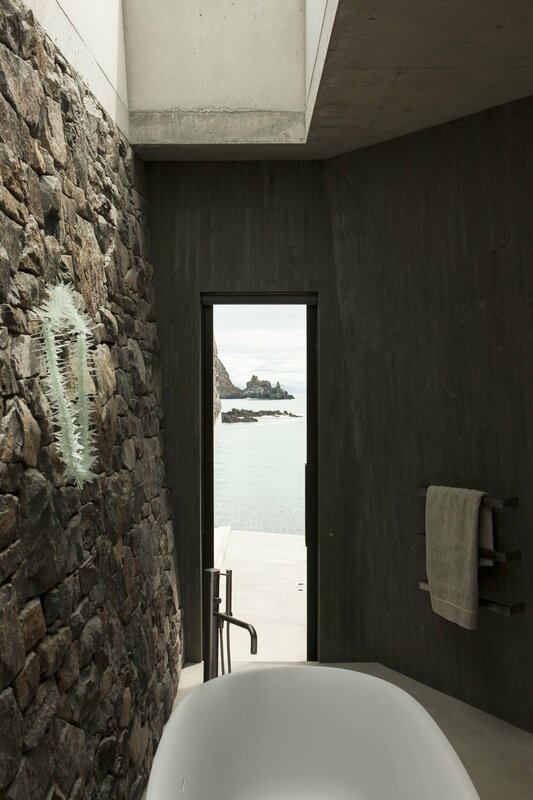 In the master bathroom, a matte Ove tub from Wetstyle is one of Maca’s favorite getaways. 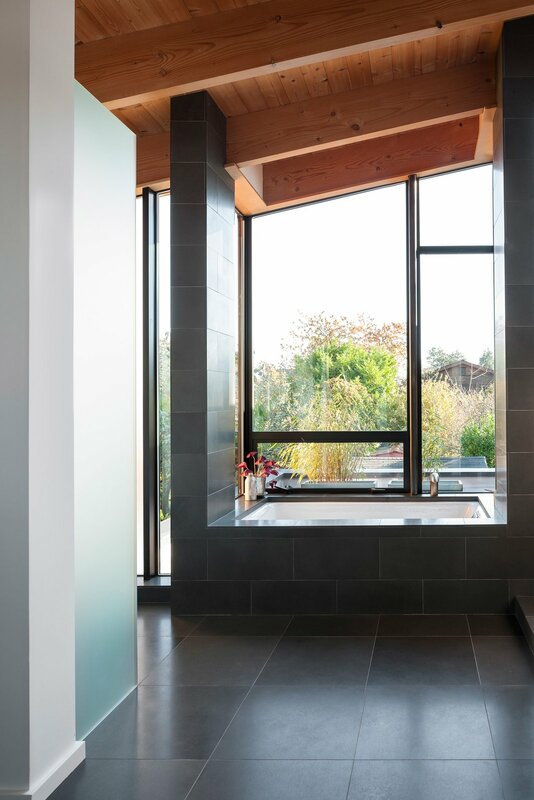 The angle of the custom window, designed with a minimal frame to maximize the view, mimics the roofline. 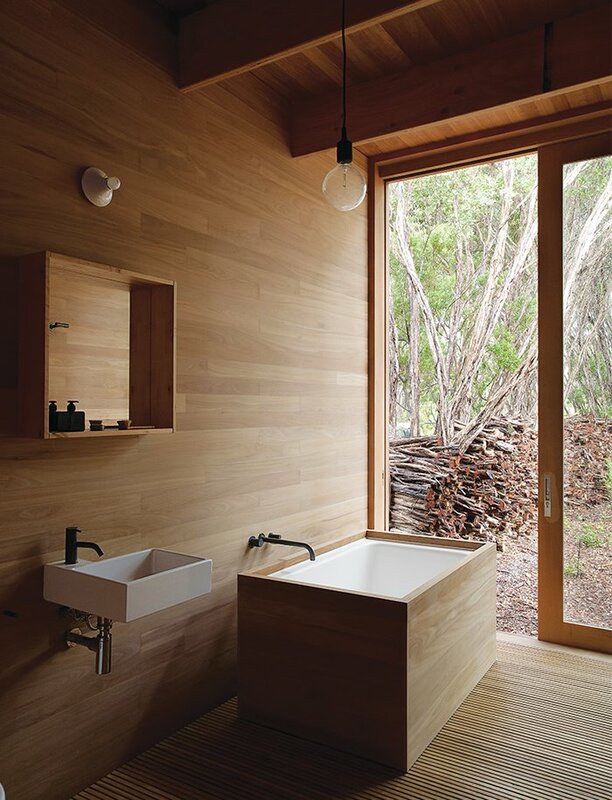 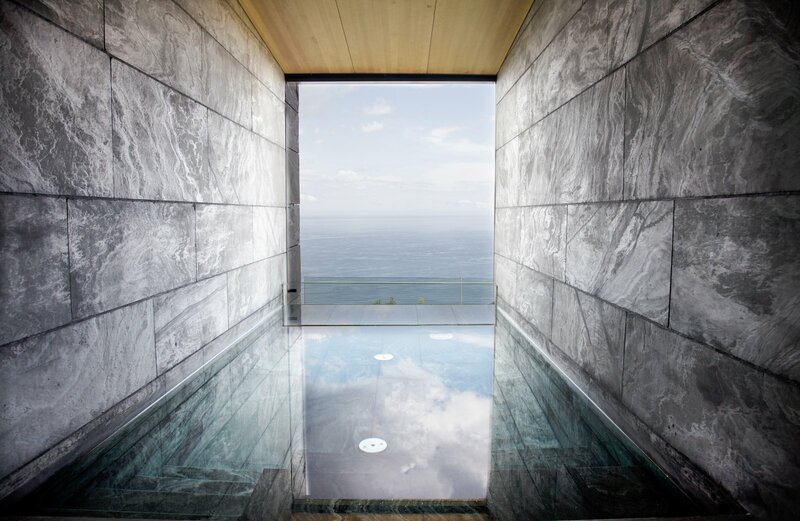 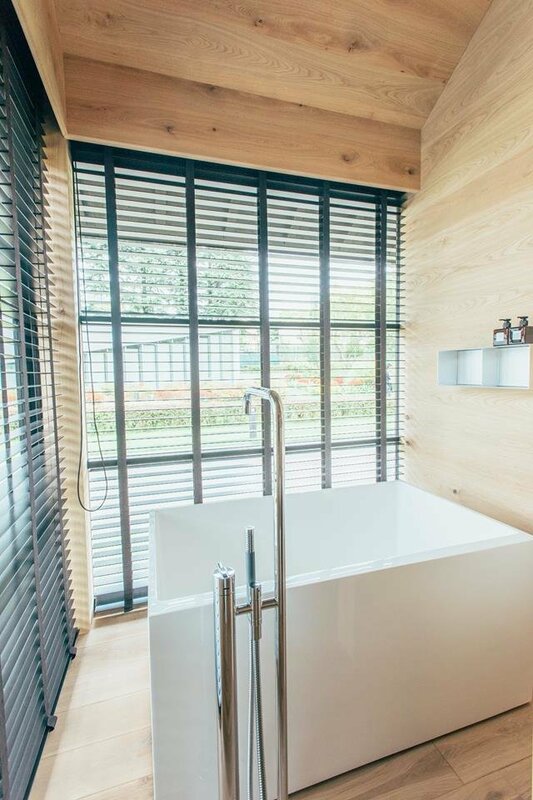 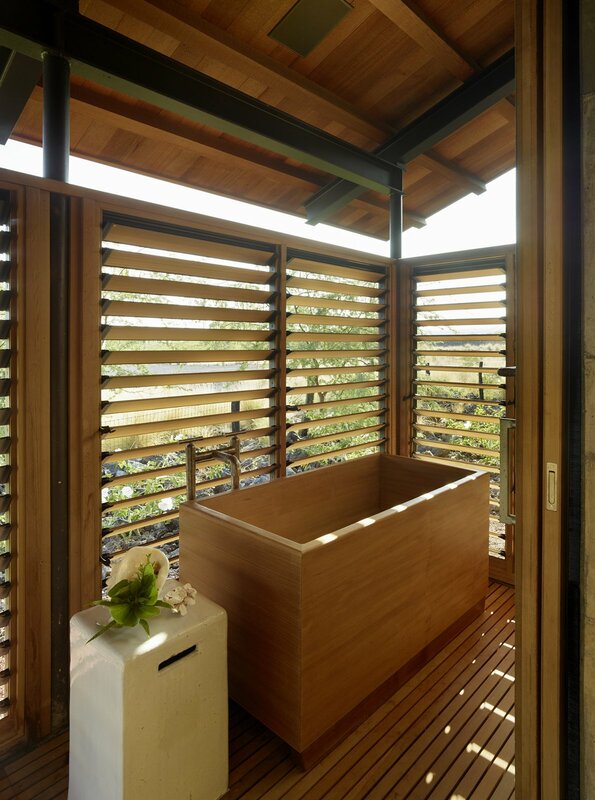 One such vacation inspired the tub, made of aromatic hinoki wood, in the master bathroom. 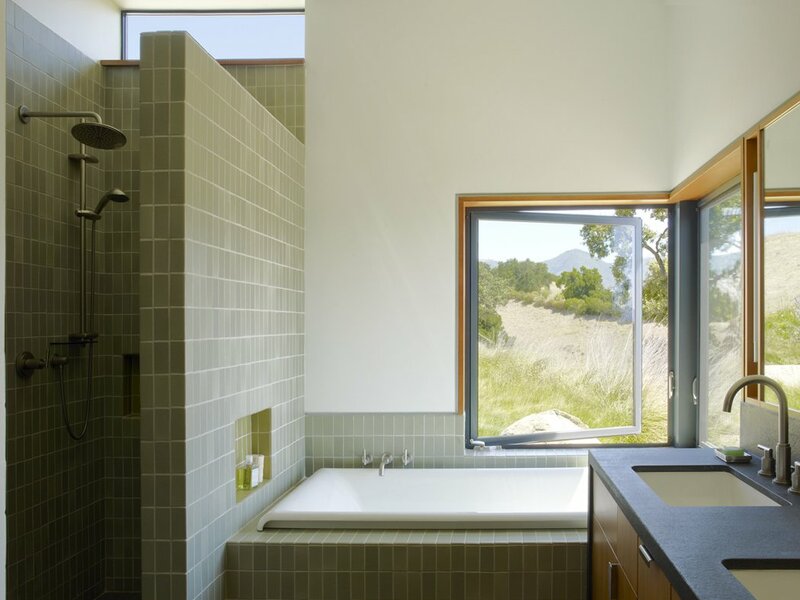 The master bathroom features one of two corner windows in the house. 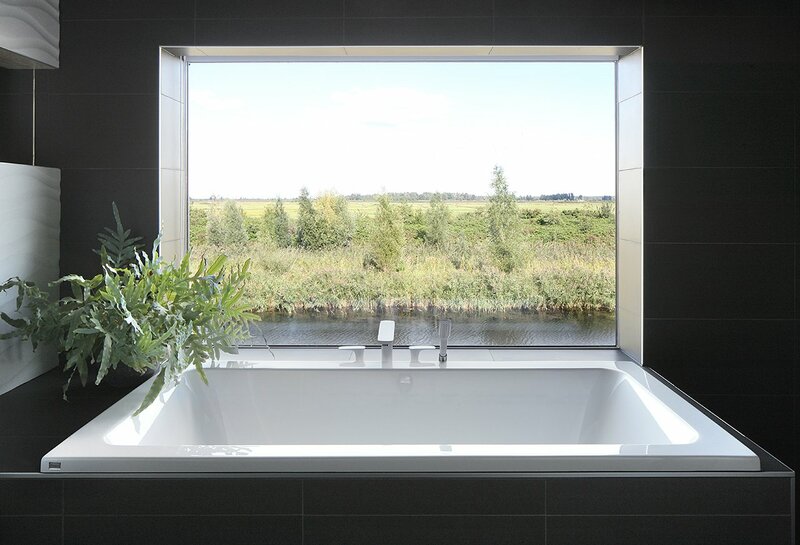 “At night, when I take a bath, I can see the moon and the stars,” says Lois. 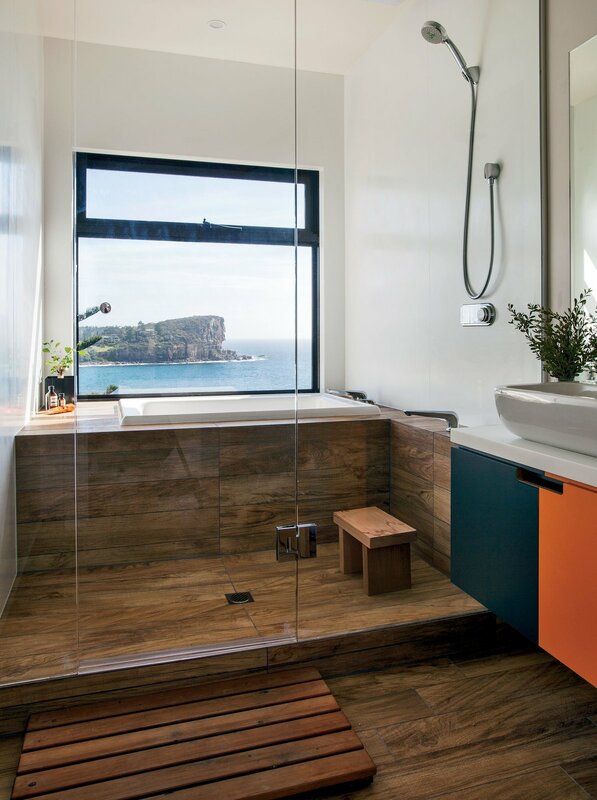 An Envy II Wall-Faced Suite toilet by Parisi sits in the home’s sole bathroom and Caroma’s Starlett 1850 Island Bath was installed next to the window. 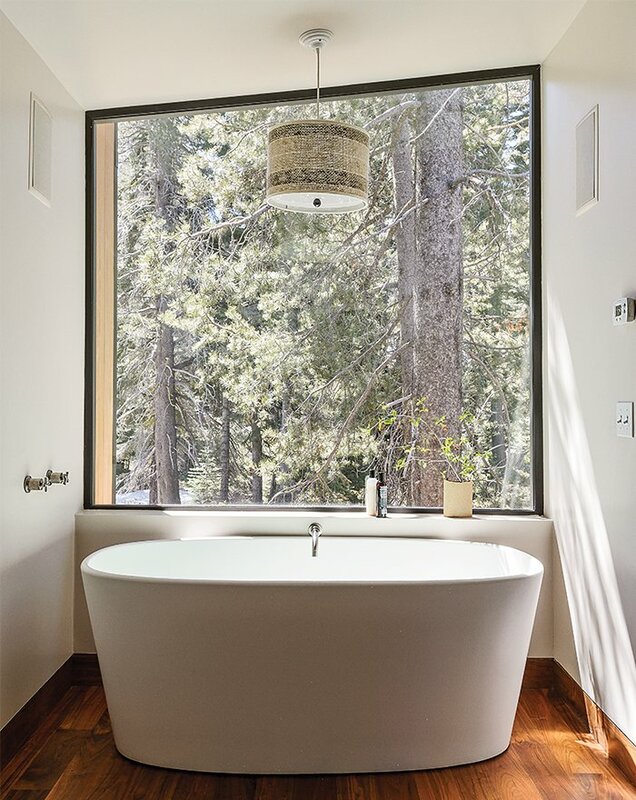 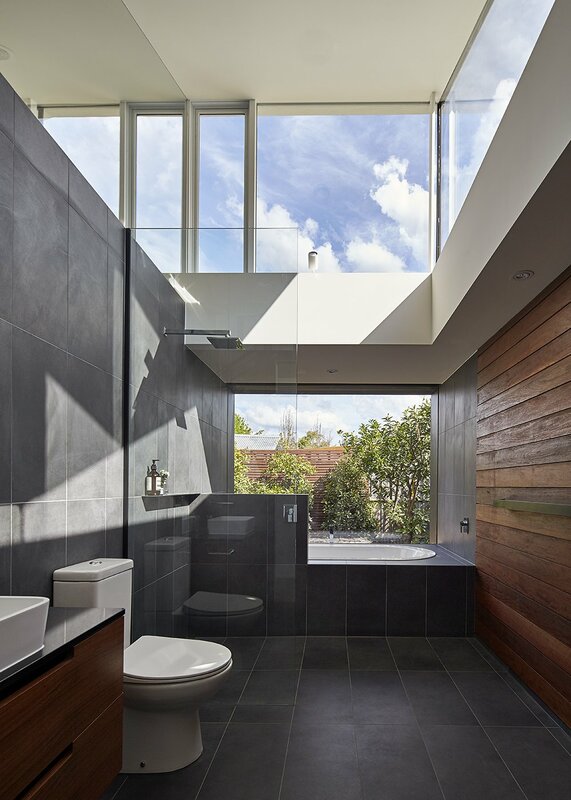 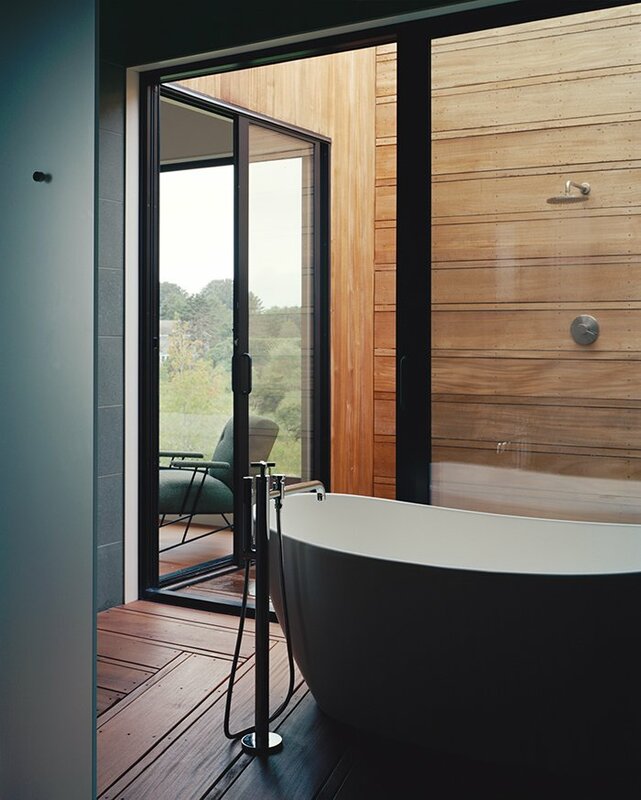 Sliding glass panels in the bathroom open to put the tub in the tree canopy. 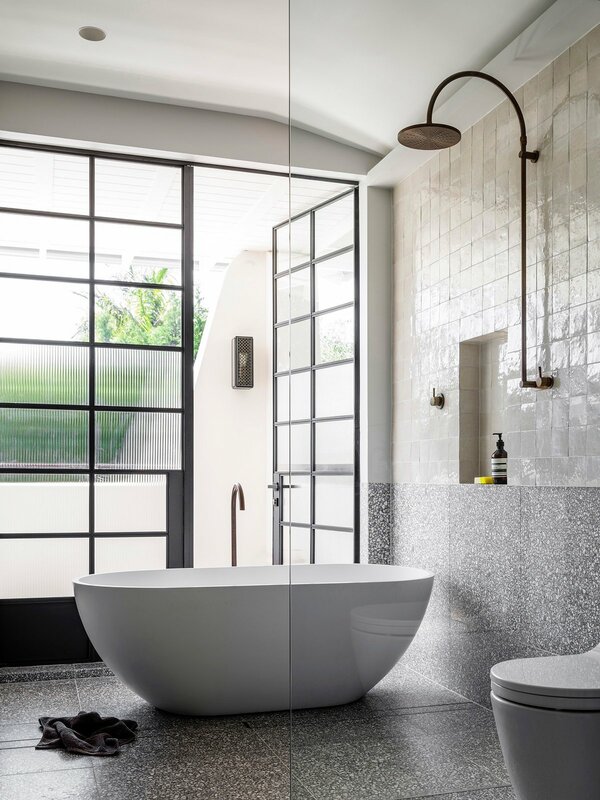 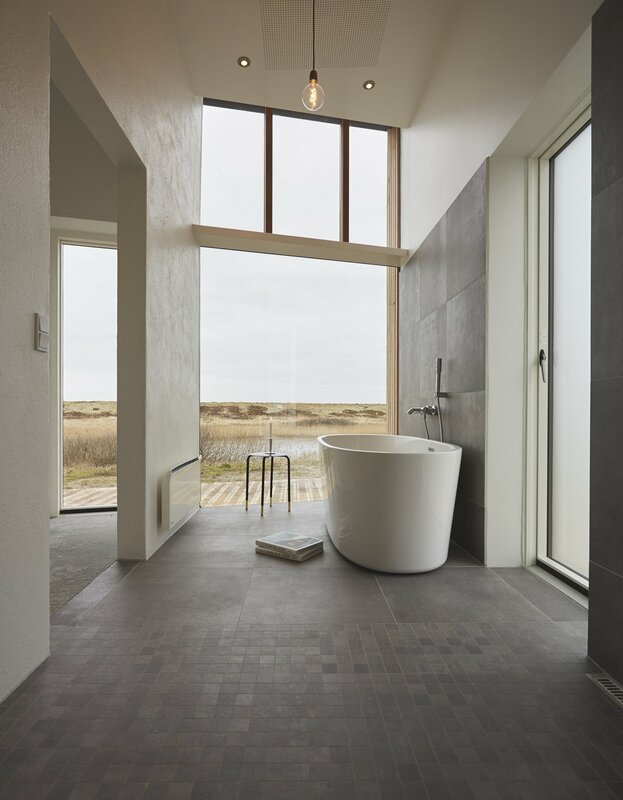 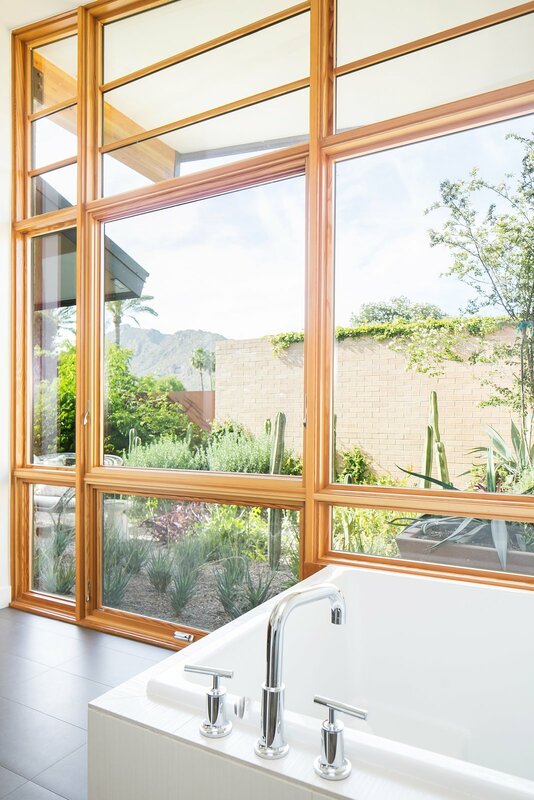 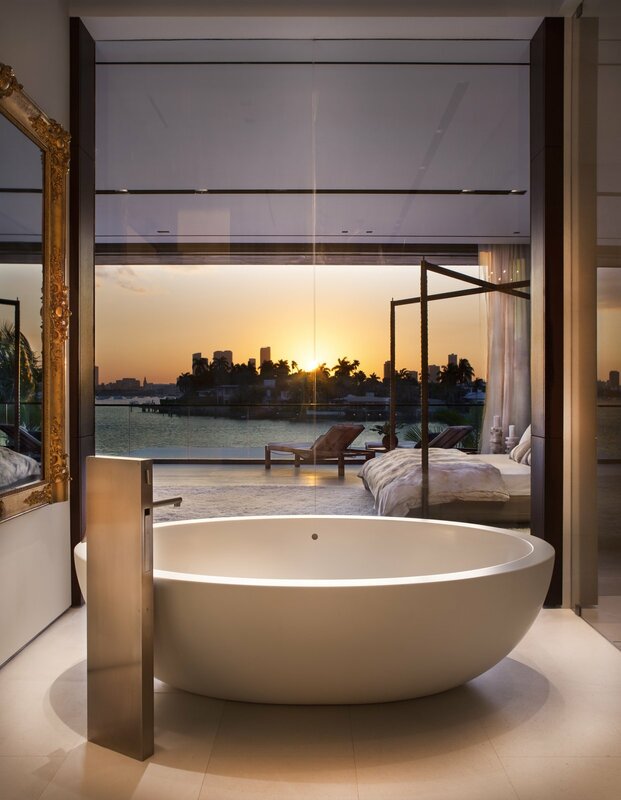 The master suite’s bathroom unfolds from a glass-walled bathing room, outfitted with a Signature Hardware tub and Lefroy Brooks fixtures, to an open-air shower.